The Holy Rosary is prayed Monday through Friday after daily Mass and Saturday after the 4:00 p.m. vigil Mass. 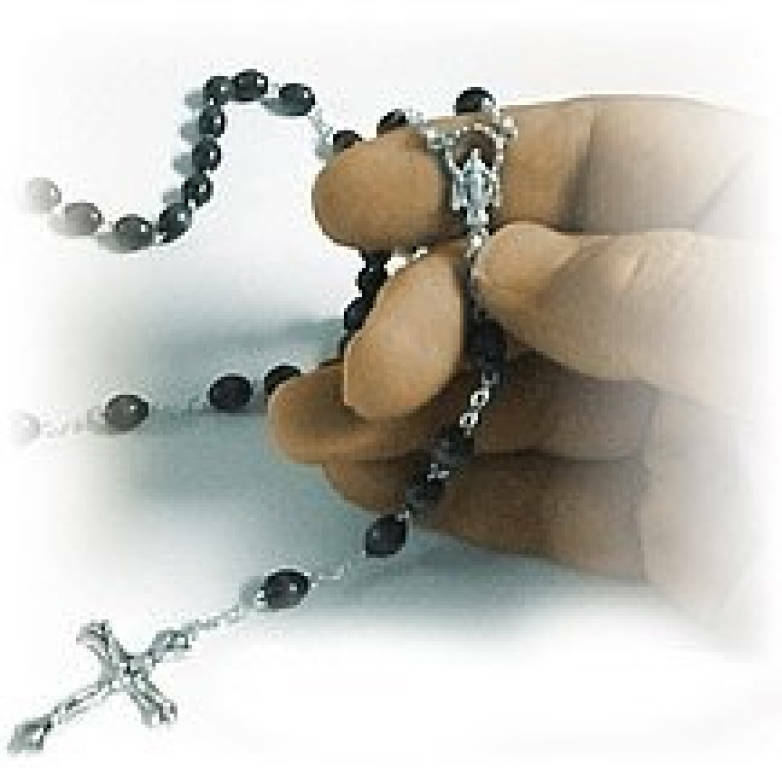 The Catholic rosary is a devotion dedicated to the Blessed Virgin, the Mother of God (CCC 971). The rosary consists of fifteen decades. Each decade focuses upon a particular mystery in the life of Christ and his Blessed Mother. It is customary to say five decades at a time, while meditating upon one set of mysteries. Hail, Holy Queen, Mother of mercy, our light, our sweetness, and our hope. To thee do we cry, poor banished children of Eve. To thee do we send up our sighs, mourning and weeping in this valley of tears. Turn then, most gracious advocate, thine eyes of mercy towards us and after this, our exile, show unto us the blessed fruit of thy womb, Jesus. O clement, O loving, O sweet Virgin Mary. Pray for us, O holy Mother of God that we may be made worthy of the promises of Christ. The angel of the Lord declared unto Mary. And she conceived of the Holy Spirit. (Hail Mary . . .) Behold the handmaid of the Lord. Be it done unto me according to thy word. (Hail Mary …) And the Word was made flesh. And dwelt among us. (Hail Mary …) Pray for us, O holy Mother of God. That we may be made worthy of the promises of Christ. Let us pray: Pour forth, we beseech thee, O Lord, thy grace into our hearts; that, we to whom the incarnation of Christ, thy Son, was made known by the message of an angel, may by his passion and cross, be brought to the glory of his resurrection, through the same Christ our Lord. Amen.